There is a lot going on with this casual outfit, because of all of the accessories. 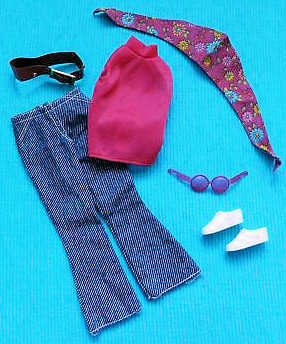 The floral scarf, belt and sunglasses can be very difficult to find. The jeans and sleeveless top usually hold up very well and are fairly easy to find in good condition. Because the scarf is a "3 corner" scarf, I assume it is intended to be worn on the head, like a bandana.